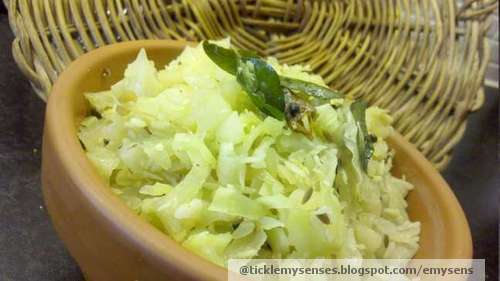 We make this tasty and simple Mangalorean vegetable sukke very often at home. The blend of basic spices along with freshly grated coconut makes the 'boring cabbage' very appetising. 1. Slice the cabbage finely. Wash well. Wash cooked canned channa under running water well. 2. In a bowl take grated coconut, add cumin powder, tumeric powder, sugar and tamarind extract, add sufficient water and mix well to form a coarse masala. Keep aside. 3. In a wide vessel heat oil, when hot add mustard seeds, allow to splutter, add ural dal and curry leaves. Allow to fry till dal turns lightly brown then add masala. Fry for a minute on a medium flame. Then add less than 1/4 cup hot water and salt to taste. Add channa (optional). 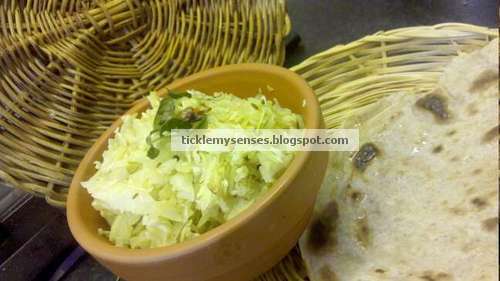 Once the mixture comes to a boil add the finely sliced cabbage, mix well to coat all cabbage with masala. Close lid and cook on a medium flame for a few minutes till cabbage is cooked but still tender, tossing cabbage in between to ensure even cooking. Taste for seasoning. Serve hot. Tasty cabbage sukke is ready. Serve with a rice, daaliso saar and a dry meat dish.